WordPress blog system support smileys in blog posts. We can enter a smiley characters in post editor and it will appear as the original smiley when the post get published. The use of smiley is an instant way of expressing thoughts and sometimes even powerful than words. Unfortunately Blogger blogs doesn’t have a system to Use Yahoo smiley’s in Blogger posts. 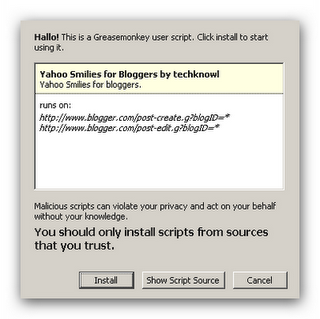 Now for using Yahoo smileys in Blogger posts, what you need to download is a Mozilla Firefox addon called Greesmonkey. This addon will allow the execution of user scripts on FF browser. 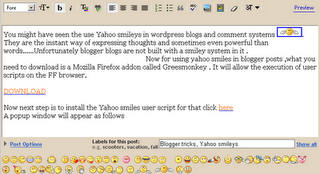 (Blogger Text editing area with smileys after applying this trick). 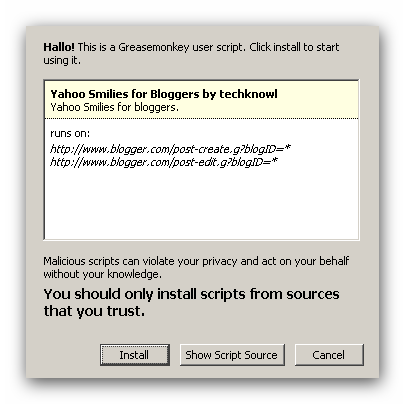 Now next step is to install the Yahoo smiles user script in Blogger. For that, click here. A pop-up window would appear as shown below!! Click on install and refresh the text editing area for the new Yahoo smileys widget to get displayed.You can edit the script at any time and add new smiles using the Greesmonkey addon features. 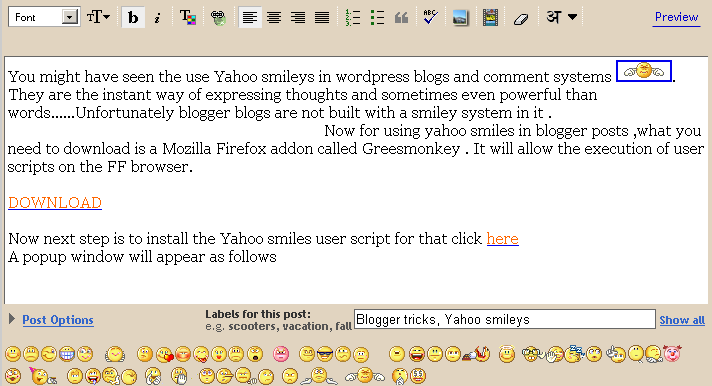 Now for adding the Yahoo smileys from the dock, click on any smiley you want and drag it to the Blogger text editing area. Note that this trick will not work for Blogger in draft. Update: The script stopped working in new Blogger. So we removed the download. Thanks! !